Margaret Veronica Dibble died Sunday, November 25, 2018 at her home. Funeral Services will be held at 10:30 AM, Saturday, December 1st at Lensing Funeral and Cremation Service, Iowa City, where the family will greet friends after 9:30 AM Saturday. Burial will be at St. Joseph Cemetery. In lieu of flowers, memorials may be directed to the American Society for the Prevention & Cruelty to Animals www.aspca.org or to the Humane Society of the United States www.humanesociety.org PO Box 167, Iowa City, IA 52244. Margaret was born in Chicago on May 13, 1923 to Elizabeth Rehak and Sylvester Jurcak. Her father passed away while she was young. Her mother and family came from Slovakia. She was the first person in her family to be born in this country. She attended Sacred Heart Academy in Lyle, Illinois and Oakwood High School in Dayton, Ohio. During her high school years she was a member of a book club and did extensive reading. After High School she attended a business college learning secretarial duties. 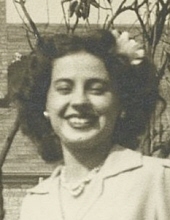 At the beginning of World War II Margaret worked in an office at Wright Field in Dayton, Ohio where she met her future husband, Lowell Dibble. She enlisted in the US Women's Army Corp. (WAC) where she also worked in the office. She received her boot training at Ft. Oglethorpe, Georgia. Later she was transferred to an Army facility in Michigan. In later years she did volunteer work as a senior peer counselor and served on the jury at the University of Iowa Law School mock trials. She was very fond of dogs, especially Siberian Huskies which she made sure they were well taken care of. A couple years ago she adopted a rescued dog name Moxie that no one else would adopt and made sure it had a good home. Margaret enjoyed reading, especially mystery books. She read the local paper everyday and had strong opinions about current issues and would write published letters to the editorials. She was an expert in crocheting and made the most beautiful afghans and dabbled in needlepoint as well. She was very fond of getting on the road for adventurous day trips. This spirit in her was the reason that at the age of 95 she still lived at home independently with her husband Lowell. Margaret is survived by her loving husband of 72 years, Lowell and their four children and two grandchildren, Alan of Ireland, Victoria (Michelle) of Spicewood, Texas, Mark of Morse, Iowa, and Bruce (Andrea) of Solon, Iowa and their children, Mason and Nora. To send flowers or a remembrance gift to the family of Margaret Veronica Dibble, please visit our Tribute Store. "Email Address" would like to share the life celebration of Margaret Veronica Dibble. Click on the "link" to go to share a favorite memory or leave a condolence message for the family.